First stage offered good weather and 30dgrs on a 19km circuit that was to be encountered 5 times, including intermediate sprints and QOM points. Lauren got into a five rider breakaway with Dani King (Wiggle), Shelley Olds (Cylance), Tiffany Cromwell (SASI) and Kathrin Garfoot (Orica). In the last km Garfoot attacked the group. Lauren managed to close the gap just before the finish to make sure there was no time gap and finished 4th. In the bunch Julie also finished to a top 10. The second stage was a criterium downtown Adelaide. With no bonus seconds to sprint for, the fight for the jersey would be between the four riders holding same time from stage 1. With four laps to go the race got hectic and Tatiana & Julie was caught in crashes. In the front of the race, Lauren did a great job to finish 5th on the stage and advanced to 2nd overall behind Garfoot. On stage three, still without bonus seconds to fight for, it was all about placing high in the race to take the advantage for the leader’s jersey. The 100.8km long stage of four laps would be a tough one for the girls with 42dgrs out in the burning sun in addition to hard racing. After several attempts of breakaway, Amanda Spratt (Orica) managed to escape. Behind a chase formed with all the GC contenders (Garfoot, Olds, King & Cromwell) including our Lauren in addition to Lizzie Williams (Orica). Orica played their cards well and as Spratt got caught after hard work by Lauren and Cromwell, Williams attacked and stayed away for the win. In the sprint behind Williams, Garfoot finished 2nd ahead of Lauren in 3rd. Garfoot kept her leader’s jersey for another day, 2 places ahead of Lauren in 2nd. In the bunch Julie got another good top 10 in 9th. On the last stage, another criterium in Adelaide, Lauren knew she would have to finish 2 places ahead of Garfoot to take the overall. The Hitec girls did all they could, with small number of riders, to protect Lauren. The race finished in a bunch sprint and Lauren eventually finished in 8th place while Garfoot took 3rd and won the overall. With Olds finishing in 4th place she sneaked into a 2nd in the GC leaving Lauren at 3rd overall. A great and solid start to the season. The stage was won by Kimberly Wells (High5). 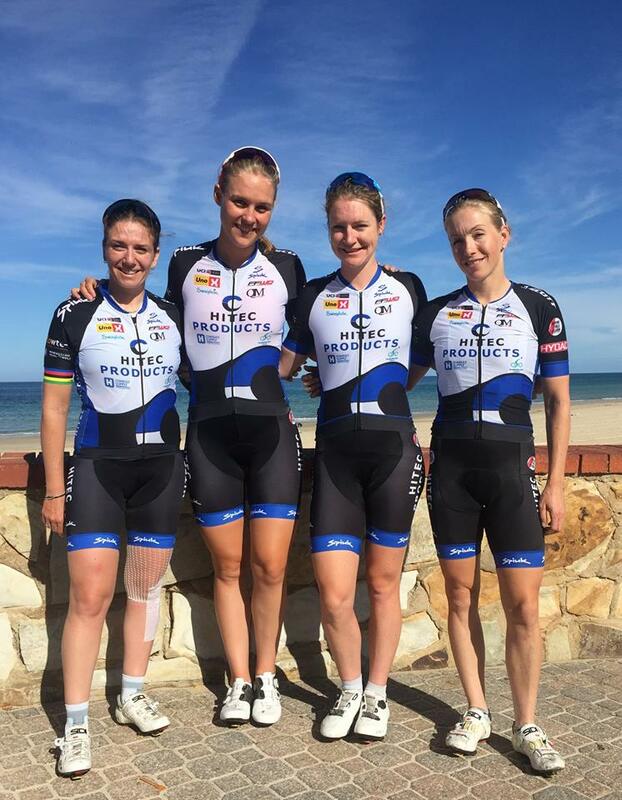 Team in Australia: Lauren Kitchen, Tatiana Guderzo, Julie Leth and Janicke Gunvaldsen.